We are going to bring it to you at a super low price!! "You’ve got to love coffee to truly appreciate this phenomenal brew. Brewed with an abundance of flaked oats, bitter and sweetened imported chocolates, Sumatra and Kona coffee. We’re actually not sure if this is some type of coffee cake or a beer. Either way you can drink this ale with a fork. 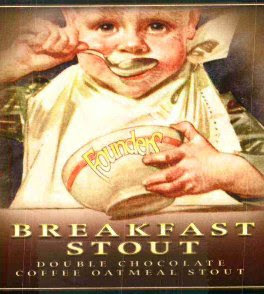 Breakfast Stout has an intense fresh roasted coffee nose topped with a cinnamon colored frothy head that seems to never fade and makes you wish breakfast could last forever. "